Until about a year ago, I would always use salted butter in my baking recipes. Why? Two reasons. The primary one, I am lazy. I buy my butter in bulk at Costco, 4 pounds at a time. The only butter they sell packaged in individually wrapped sticks is salted butter. The unsalted butter comes in 4 one pound bricks that you have to cut down if you are using less than a pound at a time (which is always). I question my cutting accuracy and really don't want to have to break out the scale and start shaving off slices of butter until I have exactly the right weight. The second reason I used salted butter, is I like salt. I like the taste of a hint of extra salt in sweet baking recipes. Salted butter is generally a "no no" according to many experts in the baking world. It's most common to see baking recipes that call for unsalted butter. The thought is you don't know how much salt is in the butter. Many baking recipes already contain salt, so you could potentially end up having too much. Others therorize that salt in butter acts as a preservative, therefore salted butter is not as fresh as unsalted. (Check out this post from David Lebovitz to read about his pro-salted butter thoughts). Before I started baking multiple times a week, I don't think my taste buds were honed enough to really notice if using salted made a real difference in most recipes. As my baking became more frequent, I caved to peer pressure and made the switch to unsalted butter and I take my chances on my cutting accuracy (still haven't caved to use the scale...yet). For the most part, I don't miss salted butter. Except when it comes to chocolate chip cookies. It is the one cookie that I can taste the extra salt and even crave it. The salt contrasts with the deep caramel-esque brown sugar in the cookie dough and the rich semi sweet chocolate chips. Though I don't use salted butter anymore, I do throw in an extra pinch in my chocolate chip cookies for good measure. Last year I started a quest to find "the one". 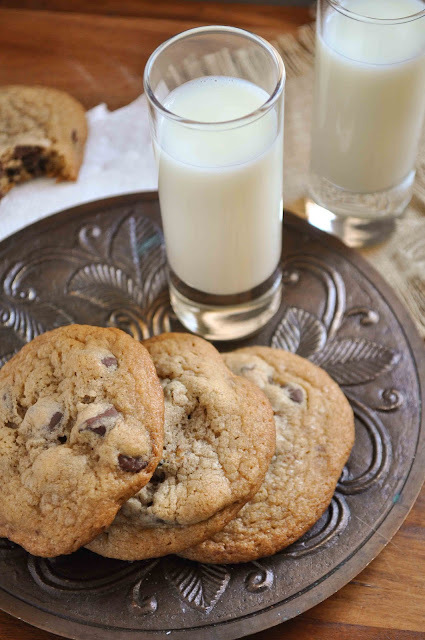 The perfect chocolate chip cookie. In fact I made, and quickly devoured, the Perfect Chocolate Cookie from Cook's Illustrated. I ate up Alton Brown's Chewy Chocolate Chip Cookie. I sliced, baked and inhaled Melissa Murphy's Chocolate Chip Cookie with Toasted Almonds. Then I made my best friend Crystal's "Oops" version of that same cookie using milk chocolate and a touch extra butter and found myself loving yet another chocolate chip cookie. And up until my official quest began, I have been making the Nestle Tollhouse cookie as my go to cookie for most of my baking life. I have been pretty happy with that cookie to be honest. With it's slightly crispy edges, chewy middle and that salty sweet contrast, I could never eat just one. This cookie from Baked: New Frontiers in Baking, is very similar to my beloved Tollhouse cookie. If you hold the recipes up side by side the ingredients are nearly identical, with the exception of the proportion of brown and white sugars. The Baked recipe has less granulated sugar and more brown sugar. The Baked recipe also calls for dark brown sugar (which has a higher molasses content then light brown sugar) bringing more caramel tones to the cookie, making it a winner in my book. I am beginning to think there isn't just "one". Why should we have to choose? 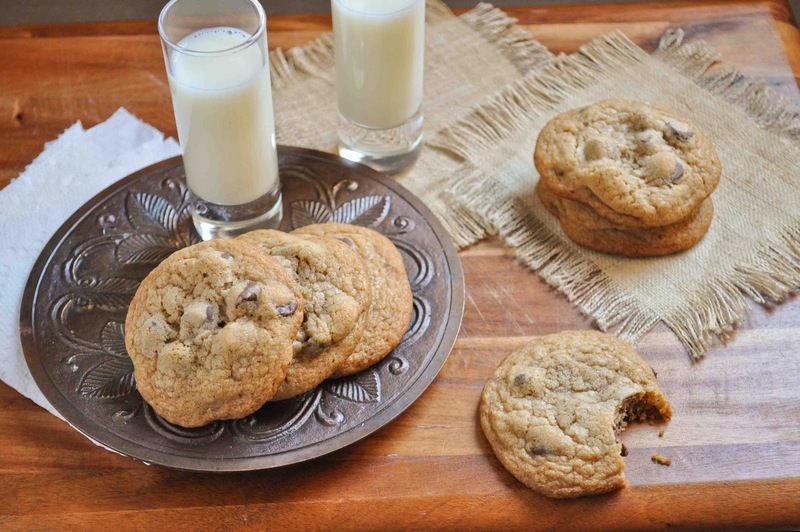 Each chocolate chip cookie has its own qualities, textures and flavors that are all deserving of admiration. What are your favorite chocolate chip cookie recipes? Whisk flour, salt and baking soda in a medium bowl. In a stand mixer, using the paddle attachment beat the butter and sugars until smooth and creamy. Scrape down the sides of the bowl and add the eggs, one at a time, until they are fully incorporated. Add vanilla and beat until just incorporated. Add half the flour mixture to the butter mixture and beat on low for 15 seconds or until just incorporated. Add the remaining flour mixture and beat until just incorporated. Fold in the chocolate chips using a wooden spoon or rubber spatula. Cover dough with plastic wrap and refrigerate for at least 6 hours or overnight. Preheat oven to 375 degrees F. Line 2-3 baking sheets with parchment paper (depending on how many cookies your dough yields). Using a scoop or a spoon, portion out dough into 2 tablespoon sized balls. Use your hands to roll dough into a ball. Place on baking sheets about 1 inch apart. Bake for 12 to 14 minutes, rotating the pans from front to back and top to bottom in the oven halfway through baking. The cookies should be golden brown around the edges and just set in the middle. Remove pans from the oven and cool on a wire rack for 5 minutes. Transfer cookies to the rack using a spatula to finish cooling. Store in an airtight containing for up to 3 days. Gerry, the Jacque Torres cookie from the NY Times is the last cookie on my CCC "to do" list. I've heard lots of great reviews on it. So perhaps it is "the one". I'm not sure about Camp Blogaway. Have to see how it's going to shape up with a potential family event in early May. I didn't even realize it was coming up. When I went to the photography workshop back in October a couple of the ladies had gone last year and thought it was an event where you get a lot of bang for your buck. What about you? So many cookie recipes, do we really have to choose? This looks excellent, I'll have to try it. Beautiful photos, Gloria! I saw this post in my reader earlier this week and I'm trying them tonight. I totally agree that you can't have too many good CCC recipes. My current favorites are the NYT one, The Cook's Illustrated Perfect Chocolate Chip Cookie, and one from Alice Medrich's cookie book. Oh, and I highly recommend getting a scale for your butter and other ingredients. I rarely use measuring cups for baking anymore. A lot of books have measures in weights now and I also have a cheat-sheet that of baking measures from the Cook's Illustrated web site. Soul food desserts is growing more popular in this economic downturn. Find out why it's the favorite comfort food for a lot of stressed out people and how to enjoy it without letting it control you. The pastries of the Italian comfort food recipes shops are the most preferred sweet dish by the people all around the world. Now there several Italian bakers shops available in several countries for providing their special pastries for the customers.